As human beings, we’re all doomed to experience loss in our lives. What follows—grief—is what sets us apart as individuals, as we find our own unique ways to express this inevitable, intensely private emotion. Sometimes it comes quick and heavy, and other times it flows slowly, on a seemingly endless track. 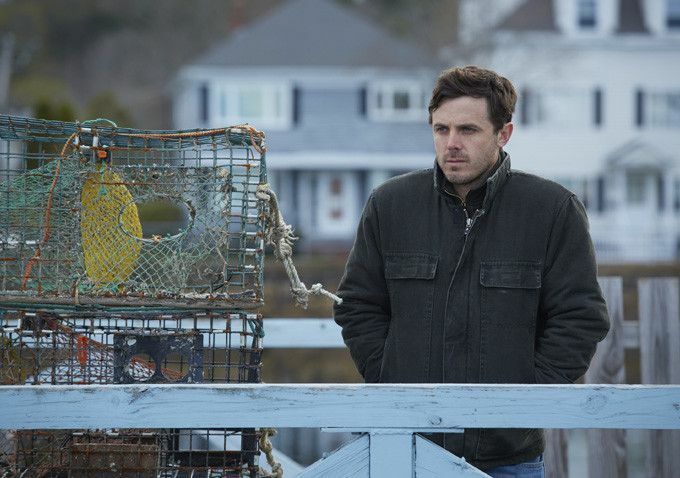 With his new film, Manchester by the Sea, filmmaker Kenneth Lonergan chronicles the effects of loss and grief with simultaneous specificity and universality, anchored by a tremendous ensemble and a stunning lead turn by Casey Affleck. It is a deeply felt, honest, and profoundly human film that once again proves that Lonergan’s knack for capturing emotional honesty onscreen is unmatched. Written and directed by Lonergan, the story follows Lee Chandler (Casey Affleck), a solitary janitor/handyman in Boston who has earned the reputation as unfriendly and rude, but in actuality just seems wholly uninterested in anything around him. One day, he gets a phone call saying his brother Joe (Kyle Chandler) is dead, so he makes the drive out to Manchester-by-the-Sea where he stays for a spell so he can put his brother’s affairs in order—which include his teenage son Patrick (Lucas Hedges), now an orphan. Still reeling from his own personal trauma, Lee attempts to settle the matter as cleanly as possible, and the story follows closely his relationship with his nephew, who is in need of a guardian. In the hands of many other filmmakers, the aforementioned synopsis would play out as expected—who knows, it might even be pretty good. You’d see a contentious relationship between Lee and Patrick start to thaw, culminating in a climactic screaming match where each one’s true emotions come to the surface, no doubt in dramatic fashion with a sweeping score and maybe even a Coldplay song at the end. In the hands of Lonergan, however, we get something completely different, intensely specific, and immensely more satisfying. Lonergan’s script deeply understands people, and as such the film marches on in a much more realistic, grounded fashion. A non-linear structure reveals key moments in Lee’s past, but each flashback isn’t treated as a puzzle piece leading up to a big emotional swell. Lonergan instead opts for hard cuts, slightly jarring the viewer and showcasing the flashbacks in a manner that mimics human memory. It’s all in service of keeping the film truthful, and the result is full immersion in Lee’s emotional state. Indeed, Lee’s reaction to his brother’s death is odd at first. He’s upset, but almost cold and very matter-of-fact. This carries over into Patrick’s initial demeanor following his father’s death, which also lacks dramatic crying fits or big breakdowns in favor of a much more guarded grieving process. As such, the time that Lee and Patrick spend together isn’t filled with the two looking back fondly on memories of Joe or consoling one another, but instead seizes the motto “life goes on” and even results in frequent but perfectly placed bouts of comedy, which feels enormously truthful to the situation at hand. Affleck is simply astounding in his performance of Lee. It’s a layered, deeply complex turn that Affleck wholly inhabits to the point that it’s hard to see anyone but him taking this on. This is career-best work, as Affleck makes continually unexpected choices that take the character in fascinating directions. And with a guy reeling from a past trauma, the cliché pitfalls are plentiful, but Affleck and Lonergan sidestep every single one, making Lee that much more real in the process. Young actor Lucas Hedges, who plays Patrick, does the same, turning in an impressive and incredibly convincing portrayal of a typically self-absorbed teenager without ever veering into bratty or off-putting territory. The entire ensemble of Manchester by the Sea is terrific, but it must be said that Michelle Williams—who plays Lee’s ex-wife—does wonders with only a handful of scenes. It would’ve been easy to let Affleck do all the heavy lifting here, but Williams soars with emotional complexity to spare, and the impact of her performance is enormous. Lonergan’s deft and delicate touch behind the camera serves this ensemble perfectly, but the skill and precision with which he crafts each scene does not go unnoticed. And Jody Lee Lipes’ excellent cinematography captures the cold New England setting with elegance and haunting beauty; there’s one shot in particular, in a hockey rink, that is jaw-dropping in its visual and emotional impact. While the naturalistic style of Lonergan’s screenplay results in a slight feeling of aimlessness towards a latter portion of the film, the movie finishes strong with a series of devastating scenes that drive home the film’s thematic undercurrent. And it’s made all the more impressive by the fact that the film’s characters don’t need these sweeping “BIG EMOTIONAL BREAKDOWN” scenes. Instead, their moments of emotional duress are specific and, by crafting such unique and fully fleshed characters, universal. We understand that while we may not react or grieve in the exact same way, the reaction of Lee and Patrick and the entire town is completely and utterly truthful, and that’s something we as observers can latch onto. This penchant for finding the emotional truth of characters is something that Lonergan has trafficked in before with You Can Count on Me and the brilliant but underseen Margaret, and with Manchester by the Sea he stretches himself to delve in specificity—of geography, of accent, of demeanor, etc. By going small, the film’s impact is huge, and by eschewing cliché in favor of capturing how real people interact, live, and wrestle with their emotions, Manchester by the Sea puts other similarly plotted films to shame. Loss is not prejudiced. It happens to us all, some sooner than later, some more devastating than others. But its effects are unique and unpredictable—the body has no automatic response mode for grief. Manchester by the Sea understands this in a fundamental way. Every aspect of the film seeks to make an emotional connection with the audience via specificity, and thanks to masterful work from Lonergan as writer and director and phenomenal performances from the entire ensemble cast, it is an absolute triumph.